Virunga is the type of documentary that I almost feel bad about not liking, except it’s not all that good so I mean, that’s really not my fault, right? It covers both the attempts to conserve and exploit Virunga National Park in the Democratic Republic of Congo. I think that’s the most comprehensive description, but the subject matter is way too big for this documentary. There’s a real lack of focus; first it’s all about gorillas, then it’s all about an evil corporation, then more about gorillas, then war, evil corporation, etc. etc. It just doesn’t flow well and seems disjointed. The problem is that the struggles here are very real and important, and it’s clear that the filmmakers are trying to put a spotlight on these issues, but there’s just too much. It almost feels like Virunga has ADD; it’s not like it’s super fast-paced, but as soon as the movie follows one path, another one sneaks up and we go down that path, maybe coming back to the first one, maybe not. Also it probably doesn’t help that I think gorillas are really scary and I was waiting for someone’s face to get eaten the whole time. But either way, I hope the rest of the Oscar documentaries are better. This movie was disappointing in a very similar way as a lot of documentaries we’ve watched. There seemed to be a problem with focus. While watching this film you go through so many different stages you kind of forget how everything fit together in the first place. The movie begins with wildlife preservation and ends with wildlife preservation but all the stuff in between points you down way too many roads. Like 20 Feet From Stardom I felt like Virunga needed more of a direction. Throughout the story you are kind of following four different individuals that are fighting to protect the park all in different ways. And because there are so many people it’s very easy to lose focus on what situation we are following at a certain time. 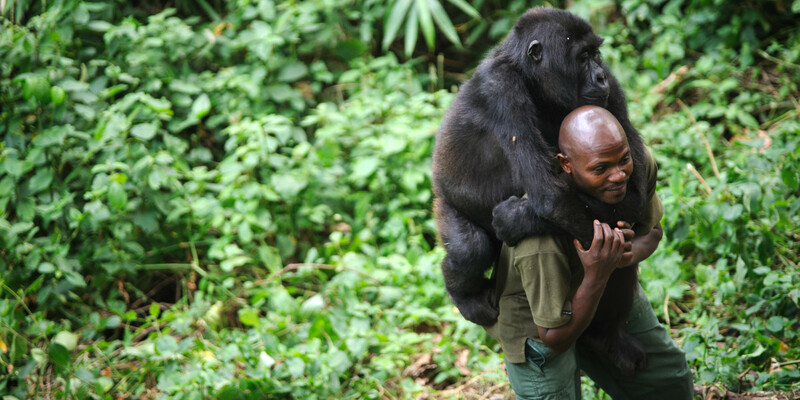 They Follow the head park ranger Rodrigue Mugaruka Katembo, a gorilla carer André Bauma, chief warden Emmanuel de Merode, and a French investigative journalist, Mélanie Gouby. That’s a lot of people, especially if you aren’t quite sure what their jobs really are. I’m not sure if this is how it was filmed but it also seemed like each person they followed were filmed very differently. It seemed like the movie was mixed with real footage of events the movie discusses, but some of the scenes felt very fake and staged. Like every scene with the French journalist. Maybe I missed something and there was an explanation for this but it made the whole movie feel off. I think this movie was made for a great cause but I think the movie itself had some problems. It should have just focused on the gorilla carer and the park ranger at most. This is the first documentary we’ve watched for this Oscar year and I really hope it’s uphill from here. And that too many aren’t overly depressing.